Logitech Circle 2 review: The best home security camera? We were so impressed with the first Logitech Circle camera - which is included in our list of best indoor smart home cameras - that we were intrigued to see how Logitech would take on community feedback to improve its successor. The Logitech Circle 2 is a more flexible device overall: it includes a wider-angle lens, weather-proofing, better battery life and more mounting options than the original. It's the last of these enhancements that really make the biggest difference: the Circle 2 can be upgraded with a battery pack that lasts up to three months on a single charge, a mount that allows it to be stuck to the inside of a window pane, or another that allows it to be plugged straight into a wall-socket. With more flexibility to suit differing needs than its competitors, is the Circle 2 the home security camera to buy? Logitech Circle 2 review: Battery powered or mains powered? The Circle 2 smart camera comes in two formats: wired and wire-free. The latter is slightly more expensive, but offers a more flexible alternative than having to plug the camera into a plug socket - which may or may not be nearby where you want it. The wired version does feature a 10ft USB charging cable, meaning it can be mounted in most places around the house that you're likely to want to place it. Logitech's big sell with the Circle 2 is the ease of setup. Pop the camera out of the box and plug it into the mains. While it's tuning on, you then download the Logi Circle app from Google Play or iTunes to your phone, turn on Bluetooth and follow the on-screen instructions. The app will then help you connect the camera to your home Wi-Fi network and then you're off capturing footage of your domicile. It's really that easy. The Circle 2 comes with an improved design compared to the original, too. The face of the camera is flatter and sleeker, which means it sits more flush when mounted on the wall. With a bold face and a white housing it's far from subtle looking though. The white cable also means it stands out, so it's hardly a stealthy security camera that you can hide out of view. The new design does mean that there's more room for bigger and better features though, including an improved speaker and mic, plus a wider-angle lens. The housing is also weather-proof now, so the design is much more versatile. With a range of accessories, you can basically fit the Circle 2 camera anywhere around your home - whether inside or out. We were impressed with the quality of the footage delivered by the original Logitech Circle camera, so it was no surprise to find that the Circle 2 is just as capable. Like its predecessor, the Circle 2 offers live streaming of footage captured up to 1080p. And with a 180° wide-angle lens, it's also able to capture a lot more of the room or area that it's facing. The Circle 2 also features a digital zoom, which can be applied to recorded to zoom in by up to 8x. For an average sized room, the camera is more than capable and pinching and zooming into shots shows all the detail you could need. Like all cameras that feature digital zoom, the quality won't blow your mind, though. This new camera also includes an automatic night vision mode which is able to capture footage up to 15 feet away. In practice, we found we could actually see further than that when reviewing our recordings - but with a mild degradation in quality. The camera defaults to 720p footage which we quickly updated to 1080p during testing. Constantly streaming 1080p footage is going to use up a portion of your broadband bandwidth, so you'll need to give this some thought if you have a fair usage policy. If you opt for the wire-free option, then lower-resolution will obviously help with battery life, too. The Logitech Circle 2 is much more than just a home security camera, it's a communication tool too. Designed with a built-in mic and speaker it's capable of transmitting and receiving audio through the associated app. Not only do recordings include audio from the area the camera is located - but it also allows you to talk directly to people on the other end. Within the app, tapping a button on the screen opens the speaker for communication on a push-to-talk basis. This means you can talk to family members, reassure pets or even greet visitors to your home. We found this to work well, so long as the camera has strong Wi-Fi signal - otherwise an image delay would cause issues. The speaker is loud but can be a bit crackly when pushed too hard. The sensitivity of the microphone can be adjusted in the app, but we found even on default settings it was perfectly capable of allowing understandable conversation. For simple day-to-day recordings, the quality is surprisingly good too. Even in a busy home environment, it was easy to hear the sounds of voices from other rooms or a television blasting in the background. The Circle 2 features an updated IP65 rated weatherproof construction. Logitech promises the camera is also capable of resisting temperatures from -20C to 50C, meaning it's more than capable of handling the wildly changeable British weather. More importantly this new weatherproofing means the Circle 2 smart camera can be used inside or out. We tested both and are happy to report that it was able to handle both environments without issue. There are some considerations however. Wiring the camera outside is not without its difficulties: if you're not lucky enough to have an outdoor socket then you'll need a hole in the wall of your home the width of a USB connection, which is surprisingly wide when you're drilling through brick and mortar. The wire-free option, therefore, is likely the more sensible option, especially if you combine it with the battery pack accessory. Window mounting is an alternative solution. Logitech provides an accessory, meaning you can install the camera inside your home but pointing outwards. The only downside here is the night vision functionality doesn't work with the camera pressed against glass and you have to rely on ambient light, meaning the image might well be unusable in the depths of night. Mounting the Circle 2 outside also saw it suffer the same Wi-Fi issues that we've had with other security cameras. The strength of your Wi-Fi signal needs to be good enough to pass through exterior walls if you're mounting a long distance from your router. If the signal isn't strong enough the camera regularly loses connection or struggles with recordings and streaming of live footage. You may want to consider a mesh network, such as Google Wifi, or a powerline adapter. The Circle 2 (with a Circle Safe subscription) offers the option of smart alerts, including person detection. The camera's recordings include highlights of people being spotted at specific times, which you can jump to in order to investigate where necessary. It's not a perfect system, though, as in the middle of one night a cat wandered into view of our test camera and was falsely identified as a human being. Witchcraft? A smart location system built into the app also means you can set the camera to not give you notifications if it recognises you're at home based on your phone's GPS signal. As standard, the Circle 2 records footage throughout the day, but it is broken down into "events" that include detected movement or people. Sometimes this means ay changes in daylight (or passing clouds if the camera is located outside) can be enough to spark an "event". We didn't find we were bombarded with notifications, though, so it's not oversensitive. Downloading and sharing of specific footage within a timeframe is a breeze. Also present within the app is day-brief time-lapse functionality. A single click and the last 24-hours can be compressed into a 30 second time-lapse video. These videos are great fun and we often found ourselves sharing them with friends and family members. Once during testing we even caught one of our children dancing in front of the camera and day-brief turned it into a super fast breakdance. One of the standout features of the Logitech Circle 2 is that you get to view 24-hours worth of captured footage for free. That means unlimited downloads, smart events, alerts and day-briefs - as long as they're all within that period. This helps the Circle 2 standout in a crowd of other smart cameras where footage is limited. Nest, for example, is restricted to three hours free footage which makes it far less useful unless you're willing to pay out for a subscription. Subscribing to Logitech's Circle Safe gives you access to two weeks worth of captured footage. If you're away on holiday or travel a lot for business then there'll certainly be some peace of mind. Premium Circle Safe subscription gives you access to a month's worth of captured footage. In addition it includes the person detection functionality - which is constantly evolving to ensure alerts are only relevant. At this top level you can also highlight motion zones and setup specific motion alerts. The Circle 2 also offers compatibility with Apple Homekit, Logitech Pop and Amazon Alexa. This means you can setup various clever commands for the camera to capture specific footage or to stop recording while you're at home with ease, if you have the relevant products. The Logitech Circle 2 has a lot to offer compared to many of its competitors: indoor and outdoor use thanks to weather-proofing, captured events are free to view for 24-hours (or up to a month if on the subscription packages), capture quality is excellent, and cloud-based encrypted storage means your private videos are safe and secure to view via app/desktop wherever you are. It's this wealth of features that make the Logitech more flexible and powerful enough to outshine the competition. So if you're looking for a smart home camera, then the Circle 2 should certainly feature high on your shortlist. It's the best home security camera we've tested to date. Logitech Circle 2 is available to buy in both wired (buy from Amazon UK and Amazon US) and wire-free versions (buy from Amazon UK and Amazon US). The Netatmo Welcome is one of the best smart home cameras we've reviewed with facial recognition being a highlight that impressed us. It is however, let down by lack of cloud backup that the Logitech Circle 2 and other competitors offer, but then it doesn't come with the subscription costs those cameras do. Canary is a strong contender for the smart home camera crown. It lacks facial recognition but we found it offered a strong experience, despite the subscription requirements. On the free plan you can get 12 hours of footage, half that of the Logitech Circle but it boasts some pretty clever features like the ability to track where household members are (i.e. away from home or not) and arm itself accordingly. 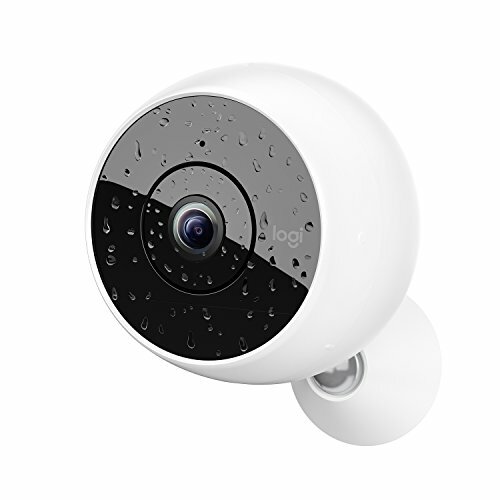 Nest Cam is a solid smart camera and has all the features and functionality you'd expect from a high-quality smart home product including great quality HD video capture, night vision mode and cloud back-up. With recent updates it also works with the rest of the Nest ecosystem including the Nest Thermostat. A worthy contender for the smart camera crown.